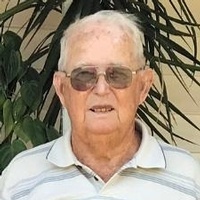 Olen Dean Vaughn of Yukon, Oklahoma, died Wednesday evening, February 6, 2019, in the Integris Canadian Valley Medical Center in Yukon at the age of 88 year. Olen Dean Vaughn was born on June 20, 1930, in Newkirk, Oklahoma, to Melvin Bud and Vanda Leah (Shurtz) Vaughn. He grew up attending Braman Schools and graduated with the Class of 1948. He married Bertha Maxine Riley on June 9, 1949, in Newkirk and they settled in Blackwell where he worked for the Dave Morgan Oil Company. In 1960, they moved to Drumright where he continued in the oil and gas industry working for Sinclair, which later became Atlantic-Ritchfield. Following his retirement in 1985, they moved to Ponca City to make their home and in May of 2006 they moved to Yukon to be near family. His wife preceded him in death on February 26, 2013, and he continued to make Yukon his home. He enjoyed gardening, reading, and visiting with his many friends. He is survived by a daughter, Patty Purvis of El Reno; a son, Lynn Vaughn of Duncan; a sister-in-law, Lila Meyers of Ponca City; grandchildren, Steven Purvis and wife Melissa and their children, Ashtyn, Rylan and Briley of Piedmont, Jerrod Vaughn and wife Kelsey and their children, Alexus and Lilly of Stillwater, Whitney Vaughn and her children, Brooklynn, Brynlee and Breckyn of Oklahoma City; and many nieces, nephews and friends. He was also preceded in death by his parents; a son-in-law, Steve Purvis; a sister, Laverna Staples; and two brothers, Eldon and Ernest Vaughn. Graveside services are scheduled for 11:00 a.m., Tuesday, February 12th in the Braman Cemetery with James W. Roberts officiating. The grandchildren and great grandchildren will serve as honorary casketbearers. A memorial has been established in his honor with the Braman Cemetery Association in c/o Roberts and Son Funeral Home, 120 W. Padon, Blackwell, Oklahoma 74631.